My husband and I have finally conceded that our son, for whatever reason, is not a chicken nugget fan. The irony of this, to me, is that according to "things you read" chicken nuggets/chicken tenders are the number one thing kids eat and in some cases the only thing they will eat. It hasn't always been this way, and may not always be the case now. He used to eat all the nuggets in a 4-piece kids meal, or at least most of them (that weren't thrown didn't fall on the floor.) Another irony is that our son loves veggies and fruit (before you stop reading I will add not ALL veggies and fruit, and not all the time). Most parents would LOVE for their kids to eat veggies and fruit and not just chicken. But I promise I don't have some magic list of 5 steps to get your kids to eat more veggies. Because the truth is, all kids are different- even siblings birthed from the exact same parents! God makes us unique. We cannot try to "cram" our kids into cookie-cutter versions of what we believe they should be and we can't judge those parents who try and try to get their kids to eat something other than chicken nuggets to no avail. But what I am seeing in the world, on the internet, on social media, and even in our churches is this pressure to be right. Don't get me wrong. I am a fan of reading blogs. And I love Pinterest. And I love community and the ability we have to share in our experiences and learn from each other. But what I have found, is that I have to read some "How to" blogs with a grain of salt because what works for someone, may not work for everyone. And just because I don't "do life" in this or that way, doesn't make me a bad, mother, wife, Pastor's wife...etc and it doesn't mean I'm wrong. -cats or dogs...or dare I say it, neither! Now, I am not looking for a ton of comments where you adamantly state your opinion on these things, but I bet as you read the list, your mind immediately went to your "side" of each issue and maybe even to the reasons why you believe your "side" is the "correct" one. But it's time we stop making one side or the other the "right side" because guess what? There is NO overall, 100 percent side that is the correct side! Yep, I said it. And the reason I did, is because of what I said above- each child, each mother, each family, every situation is different. There is NO cookie-cutter formula. The ONLY non-negotiable, absolute truth is the Bible. I'm not saying that you won't have an opinion or that you shouldn't have an opinion or that you aren't entitled to your own opinion. What I am saying is that you have to quit thinking that your opinion is the right one for everyone and the ONLY one. 1- Share your opinion graciously- For example, breastfeeding. If there is a mother who has adopted, or cannot get the hang of breastfeeding, don't make her feel inferior by the way you tell her that breastfeeding is best. Just state that that's what you did and that's what worked for your family. 2- Share your list of reasons, ONLY if they are solicited- don't immediately go into your long list (which can come off as a tirade) of reasons to support your stance. The only time really that you should is if person is truly interested and asks for your reasoning. And again, still share your reasons graciously and courteously. 3- If the person doesn't agree, LET IT GO- Remember even though you feel strongly that your opinion is the "right" one, that doesn't mean it will actually work for the person you are talking to or that it is the opinion that was chosen- (think items you vote on and elections). And just agree to disagree again with courtesy and grace. 4- Be OPEN to hearing someone else's opinion if you are openly sharing yours- and obviously do so graciously and lovingly. I heard a wonderful metaphor for this by Lysa TerKeurst in her book, Unglued, - picture a scale, that balances as you add equal weight to each side. When we have disagreements with our brothers and sisters in Christ and see them as the enemy, we tend to picture us on one side of the scale and them on the other. But the truth is, that we are all part of the body of Christ, which means we are all on the SAME SIDE and the only one on the opposite side is Satan. As we fight amongst ourselves, our side gets lower and lower and his gets higher and higher. I don't know about you, but I am not a fan of giving Satan a single inch in this battle here on earth. Instead, I want to begin to see issues with an open mind and when there are differing opinions (like what color the carpet should be in the church) I hope I can let go of my pride, and hear another's opinion. And then, even if "my color" isn't chosen, I want to just get over it and let it go. Or if a mother comes in who has decided to home-school her children and we are both gracious and loving, then I believe we can realize that neither of us think the other is "wrong" or making bad choices, we realize instead that we are both doing what we believe is "right" for our families at this time! 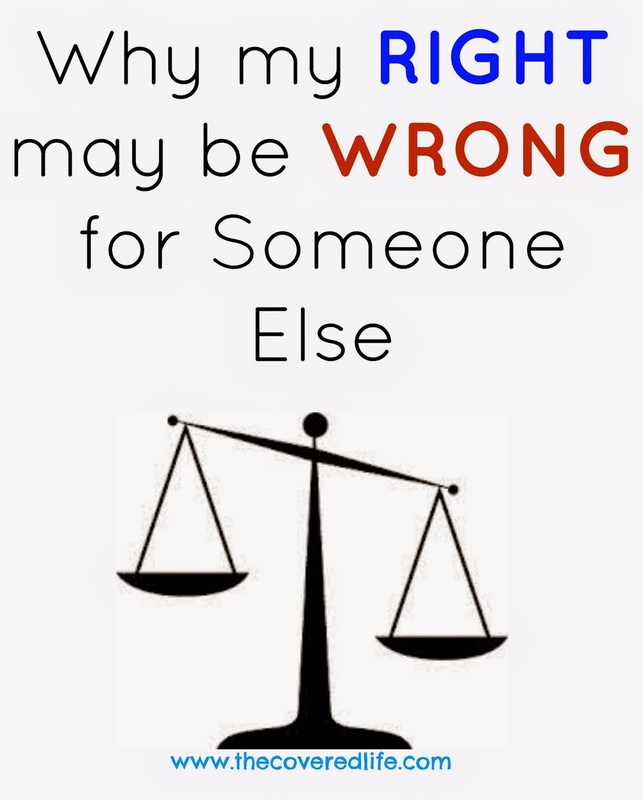 And let's realize that our version of right may be someone else's wrong- and that is OKAY!